I Love the Mountains lyrics and chords - kids love this song! Usually they learn it by rote, but using notes is a sure-fire approach when you are in a hurry. Even better, for beginners who are new to ledger line notes, the alphanotes "helper" arrangement on this page will be just what they need! And here is a "helper" version, with just a few alphanotes for those tricky keys below Middle C... see if your students can draw these very notes below a staff on the whiteboard or on staff paper. If so, the ledger lines will make sense to them. As with most folk tunes, you will find that there are slightly different words to this tune, depending where you are. 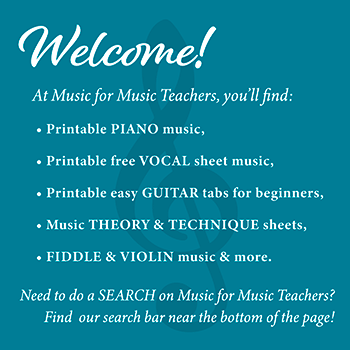 Once your students have the melody in hand, show them how to use the chords! It is such a fun duet. I like to have them try a single bass note in left hand, and a solid root position chord in the right hand. If they are more advanced, make them try some chord inversions in the right hand, as I demonstrate at the bottom of the page "Louie Louie." But the final goal is to use the right hand to play just the melody, while left hand does the bass note PLUS the triad. This approach is also a fun goal in a newer piece on my site, "The Cat Came Back." Kids feel a great sense of accomplishment when they can coordinate the hands together, and they push to get there! This is actually on my studio "Must Do" list.